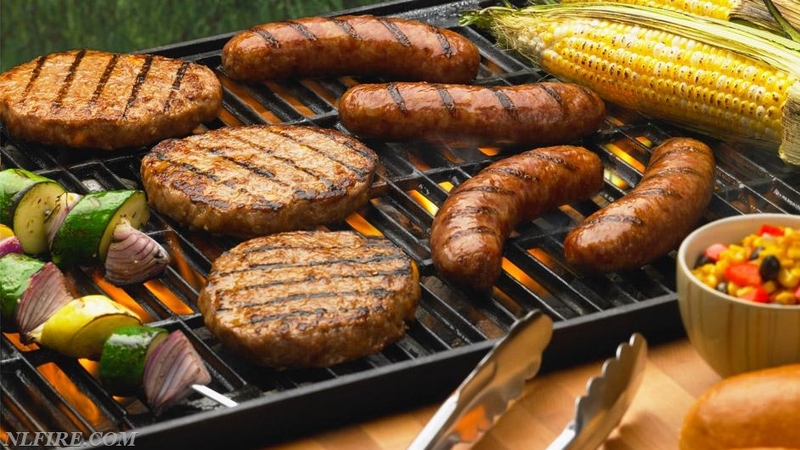 The smell of burgers and brats will soon fill the air this Memorial Day weekend, but don’t let the sizzle get out of control. According to the National Fire Protection Association (NFPA), from 2011-2015 U.S. fire departments responded to an average of 9,600 home fires involving grills, hibachis, or other barbecues per year. These fires included ten deaths, 160 reported injuries, and $1233 million in direct property damage. Five of every six grills involved in home fires were fueled by gas while 14% used charcoal or other solid fuel. In 2016, around 16,600 patients went to an emergency room because of injuries involving grills. Almost half of the injuries were thermal burns. •	Propane and charcoal BBQ grills should only be used outdoors. •	The grill should be placed well away from the home, deck railings and out from under eaves and overhanging branches. •	Keep children and pets at least three feet away from the grill area. From 2012 to 2016, Children under five accounted for 35% of all contact-type burns. •	Keep your grill clean by removing grease or fat buildup from the grills and in trays below the grill. In roughly one of every five fires, the grill had not been cleaned. •	Never leave your grill unattended. •	Always make sure your gas grill lid is open before lighting it. 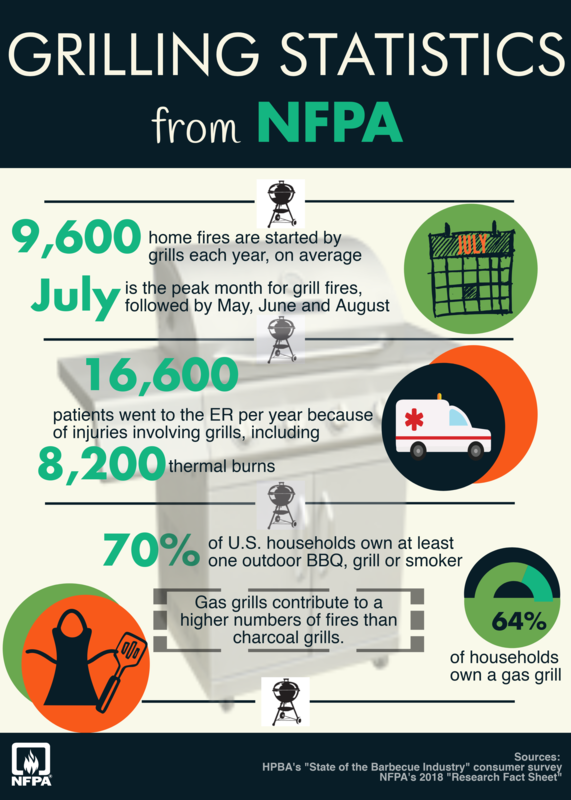 Almost one-third of gas grill injuries were burns incurred while lighting the grill. •	Cap lighter fluid immediately and place a safe distance from grill. •	Keep charcoal fluid out of the reach of children and away from heat sources. •	Never use gasoline, kerosene, or other highly volatile fluids as a starter. They can explode. •	Unplug or remove a hot starter with caution and be careful where you put it. Always cool starter completely before storing. •	Never use an electric fire starter in the rain and/or when standing on wet ground. •	When using instant light briquettes, do not use lighter fluid, electric, solid, or metal chimney-style starters. Do not add more instant light briquettes once the fire has been lit. Add only regular charcoal briquettes if more are needed. •	Once the grill is lit, do not touch briquettes or wood chunks to see if they are hot. Keep grill uncovered until ready to cook. •	Keep vents open while cooking. Charcoal briquettes and wood chunks need oxygen to burn. •	When you are finished grilling, let the coals burn out completely and let ashes cool at least 48 hours before disposing. Dispose the ashes by wrapping in heavy-duty aluminum foil and placing in non-combustible container. Be sure no other combustible materials are nearby. •	Never burn charcoal inside of homes, vehicles, tents, or campers, even if properly ventilated. Charcoal produces carbon monoxide (CO) when it is burned. Each year about 30 people die and 100 are injured as a result of CO fumes from charcoal grills and hibachi grills used inside. •	Since charcoal produces CO fumes until the charcoal is completely extinguished, do not store the grill indoors with freshly used coals. •	Check the tubes that lead into the burner for any blockage from insects, spiders, or food grease. Use a pipe cleaner or wire to clear blockage and push it through to the main part of the burner. •	Check grill hoses for cracking, brittleness, holes, and leaks, Make sure there are no sharp bends in the hose or tubing. •	Move gas hoses as far away as possible from hot surfaces and dripping hot grease. •	Replace scratched or nicked connectors, which can eventually leak gas. •	Check for gas leaks using the manufacturer’s instructions if you smell gas or when you reconnect the grill to the gas container. If you detect a leak, immediately turn off the gas and don’t attempt to light the grill until it is fixed. •	Keep lighted cigarettes, matches, or open flames away from a leaking grill. •	Never use the grill indoors. Keep the grill a minimum of 10 feet away from your house or any building. Do not the grill in a garage, carport, porch, or under a surface that can catch fire. •	Do not attempt to repair the tank valve or the appliance yourself. •	Use caution when storing gas containers; transport them in a secure, upright position. Never keep a filled container in a hot car or car trunk.